So, my best friend just had a baby girl. And she is the cutest baby! I don’t even have to lie about how cute she is, which always a relief, because, well, not all babies are cute. And I’ve been so excited about this baby girl, that I’ve had this problem where I just want to crochet all the things. I feel as if every adorable baby girl yarny thing I see on Pinterest or Ravelry must be hooked up immediately. I just can’t feasibly crochet all the things, so I crocheted several things. I made booties the weekend before my first exam of the semester, and then, after a short break from that to study, I went and made her a matching hat. Because she can’t have booties without a matching hat. The design for the hat was one that I improvised, and it’s pretty simple. 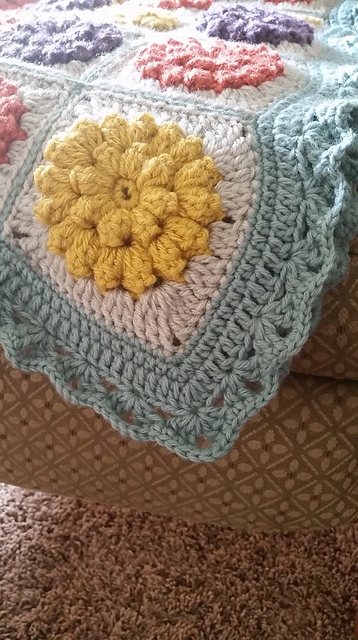 I used Yarn Bee Confection Chunky from Hobby Lobby, which is a super soft yarn. This color is called Rock Candy. I believe I used a J hook, and the hat should fit a 3-6 month old. You can follow my basic design below and continue increasing until you have the size you need, then continue with rounds with no increases until you have your desired length. Of course, the yarn and hook you use will affect the size of your finished item, as well. Skip 9 stitches on Round 7 and make the second earflap as above. Cut several lengths of yarn, a little longer than twice the length you want the braids to be. For bulky yarn like this, I cut 9 pieces per braid. You’ll fold them in half (so now you have 18 pieces of yarn, or double the amount you cut) and take the loop of the folded end and pass that through the end of one of the earflaps. You can use your hook to make a little hole if the stitches are tight, and you can also use the hook to help pull the looped end through. Then pass the cut ends through the loop and pull tight. Now, seperate the yarn into 3 equal sections and braid. When you get to your desire length, tie the end in a knot and cut off the excess. Repeat this for the other braid. Sometimes it takes a little trial and error to get the right lengths of yarn, so you don’t end up with little dinky braids, or tons of 6 inch pieces of yarn left. 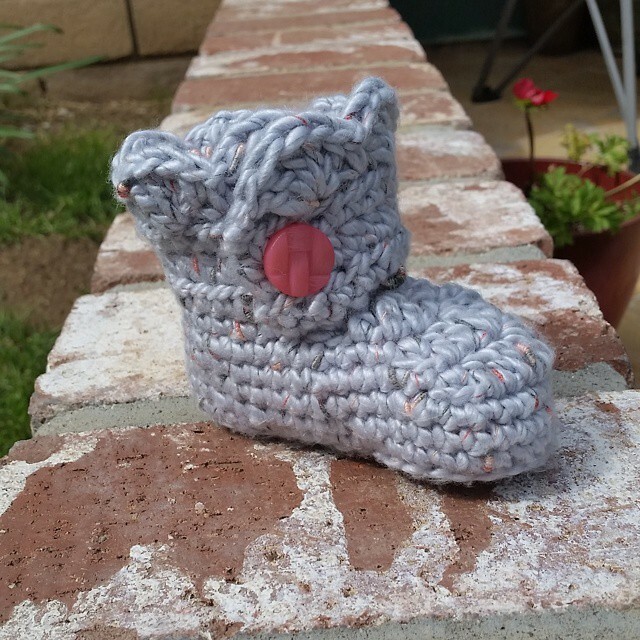 For the booties, I used a free pattern from Ashlee Marie, which you can find here. This is the second time that I’ve used her pattern for a pair of baby booties and both moms loved them! You can also leave off the scallops for a boy. 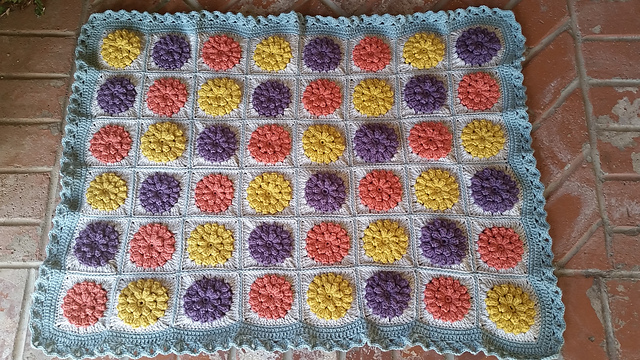 Finally, I also made a blanket for my new little love. I used the Something Pretty pattern by Mille Makes. And I think it came out quite pretty. I attached the squares using the zipper method by Look at What I Made. It takes a little fiddling to figure it out, and it does take longer to do than joining with single crochet, but it looks quite nice. I improvised the pattern for the border. I didn’t like that I couldn’t seem to get it to lay flat. But my friend says that she actually likes the way it looks a bit ruffly, so it worked out! For the border, I did 1 round of sc around, 1 round of hdc around, and 1 round of dc around. In the corners on each of those rounds, I made 3 stitches in each corner stitch to increase. Then, I did a 4th round of 2dc, ch3, 2dc in one stitch, sk 3, repeat around. In corners for the 4th round: 3dc, ch3, 3dc all in corner st. Finally, I did a 5th round of 1sc in top of each dc and 3sc in ch spaces. The pattern is available for purchase on Ravelry here. It’s worth the money, in my opinion, as the pattern is quite well-written and has instructions for both a an elephant and a hippo. I made the hippo for my nephew which I shared in a previous post. 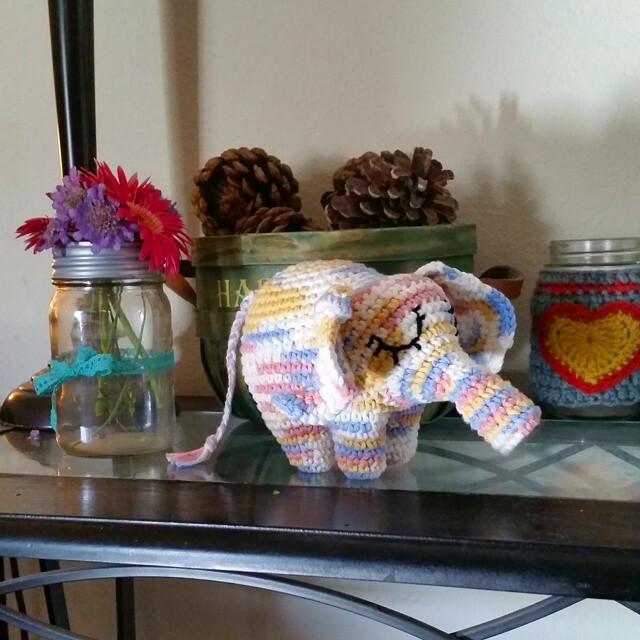 The hardest part of the elephant is stitching on the eyes to make them match. But the crochet stitches make a sort of grid, kind of like cross stitch, so I found that helpful to guide the placement of the stitches when I was trying to make them match. I suppose that it all for now. I have some studying that I should get back to on my day off from school. Last week I finally bought a crochet book that I’ve had my eye for a while. I’ve been working on some bigger projects and was really in need of an instant gratification project, so I turned to my new book for some inspiration. 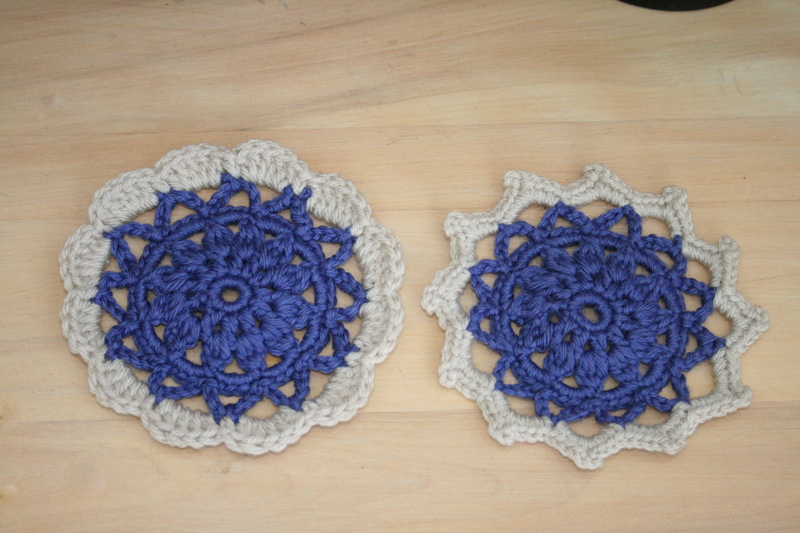 A short while later, after tweaking the pattern for one of the squares, I had some really cute coasters! After the book review below, I’ll show you my mods to the pattern so you can make your own Daisy Chain Coasters. 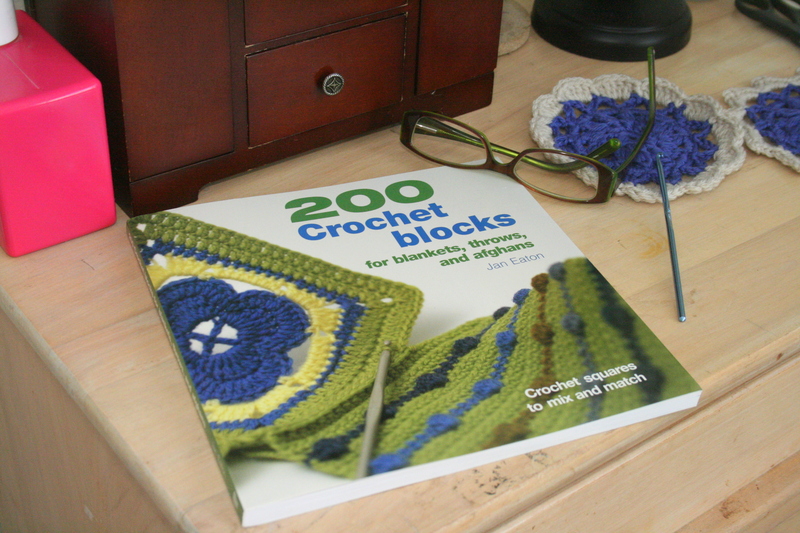 I can’t seem to put down Jan Eaton’s book, 200 Crochet Blocks. I wanted this book after seeing some really beautiful crochet projects done with the squares, such as Cherry Heart’s Sampler Blanket and Coco Rose Diaries’ Lazy Daisy Scarf. 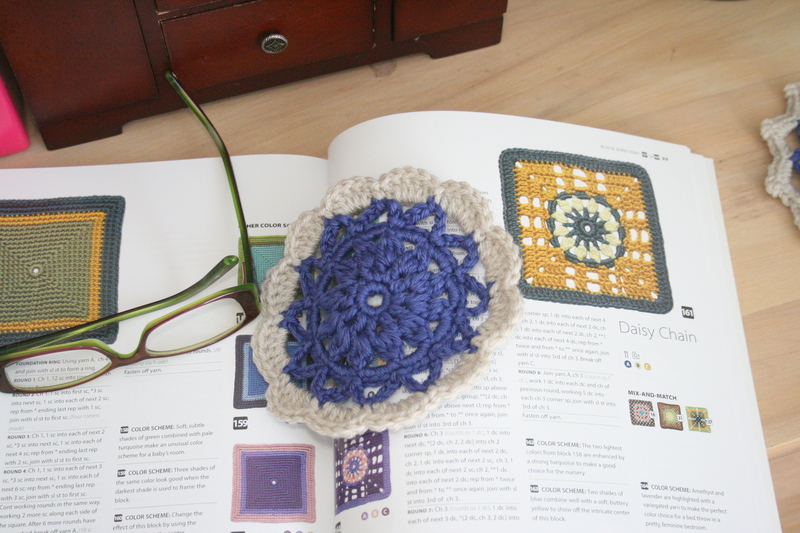 The book did not disappoint, the squares are lovely and there is something for any crochet taste. Also, I love that each square has a “mix-and-match” section at the end of the instructions which tells you other squares in the book that it would mix well with. With 200 squares, it’s helpful to see some suggestions at a glance for selecting a mix of squares that will work nicely together in a blanket. There is also a section about color that outlines how you can easily create your own color palettes. Some of the blocks are shown in multiple color schemes to give you an idea how much color can change the look of the same block. I used worsted weight yarn and an F (3.75mm) hook. 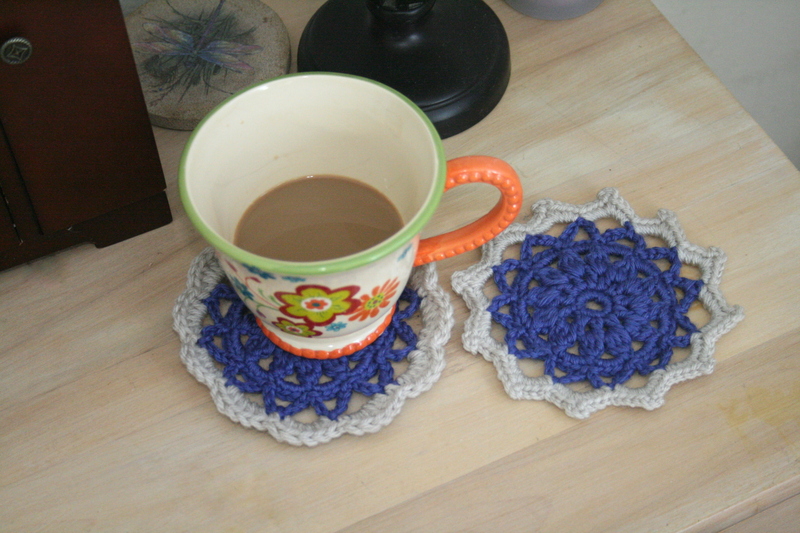 My coaster with the picot edge is 5.5″ in diameter and the scallop edged one is 5″ in diameter. You can find the Daisy Chain square on page 99 of Jan Eaton’s 200 Crochet Blocks. Complete Rounds 1-4 in one color per the pattern instructions. This is what your coaster will look like after Rounds 1-4. Round 5: Chain 6, then skip the next two stitches (don’t count the joining stitch) and then slip stitch in the the next two stitches where you see the arrows in the photo above. Repeat around until you get to the end. You will then have 12 loops of chain 6 spaces around. To end Round 5, we will do one slip stitch in the last single crochet of Round 4 and then use the seamless finish method with the first slip stitch of Round 5. You can watch the video here to learn this method if the above photos aren’t clear enough. Here is what you do: Picture 1 shows that you pull the yarn through after the last slip stitch as if to fasten off and then thread it through a yarn needle. Picture 2 shows that you insert the needle under the first slip stitch of Round 5 and pull it through. Picture 3 shows that you then insert the needle in the middle of the last slip stitch of Round 5 and picture 4 shows that you pull it under the back loop through to the back side of the work. Then weave in the end as normal. 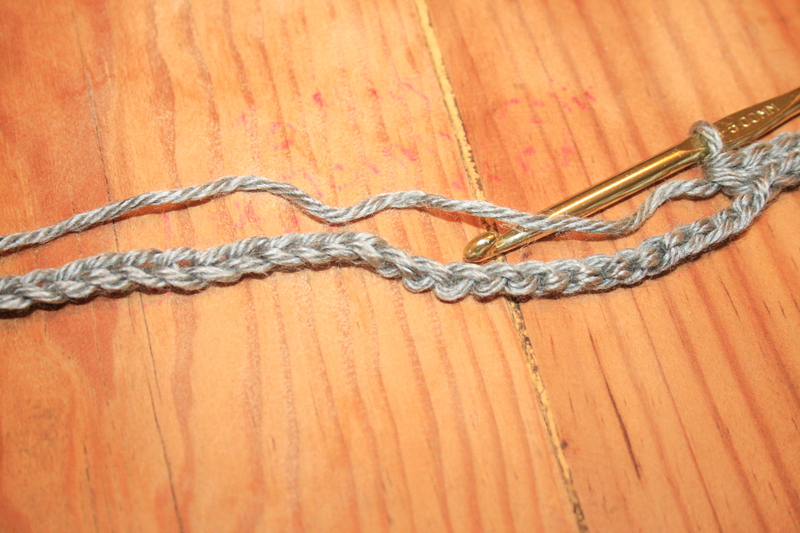 Round 6: Attach the same color with a slip stitch in any chain 6 space. Chain 5, then make one single crochet in the next chain 6 space. Continue around to the end, where we will end the round again with the seamless finish method. This time, you’ll weave in the end from the beginning of the round first to make sure that the first slip stitch of the round is secure enough to use it for the seamless finish at the end. Then complete seamless finish as instructed in Round 5. Scallop Edge: Attach the edging color in any single crochet of Round 6 with a slip stitch. Chain one, then single crochet in same stitch as join. Then, make 5 double crochets in the next chain 5 space. Make one single crochet in the next single crochet. Repeat this around until you get to the end of the round and join with the seamless finish method to the first single crochet of Round 7, not to the slip stitch. Weave in the ends and you’re done! Picot Edge: Attach the edging color in any chain 5 space from Round 6 with a slip stitch. Next, chain 1, then make 4 single crochets, chain 1, 4 single crochets, all in the same chain 5 space. Repeat in each chain 5 space from Round 6 to the end. 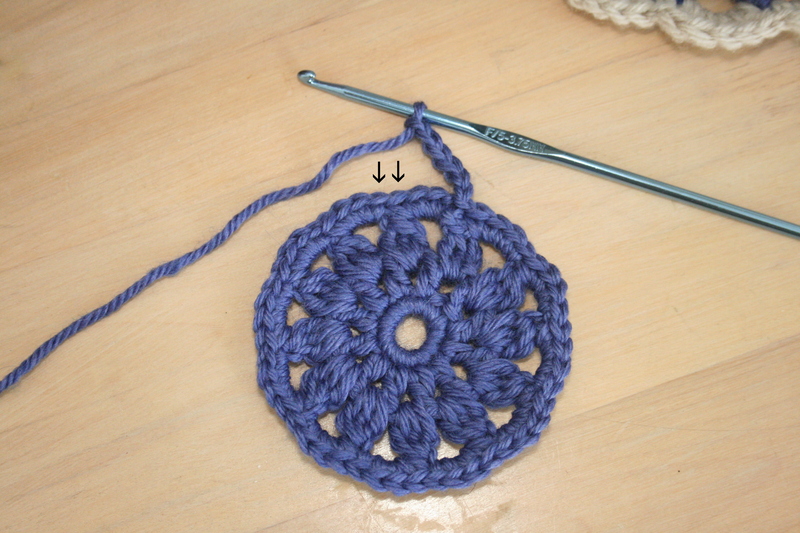 Attach with seamless finish method to the first single crochet of Round 7, not to the slip stitch. Weave in the ends and you’re done! Note: All stitches for this edging variation will be made in the chain 5 spaces of Round 6; none will be made in the single crochets of Round 6. Please let me know if you have any questions at all about this tutorial. I try to make it as clear as possible, but if something doesn’t make sense, I am more than happy to help you out! 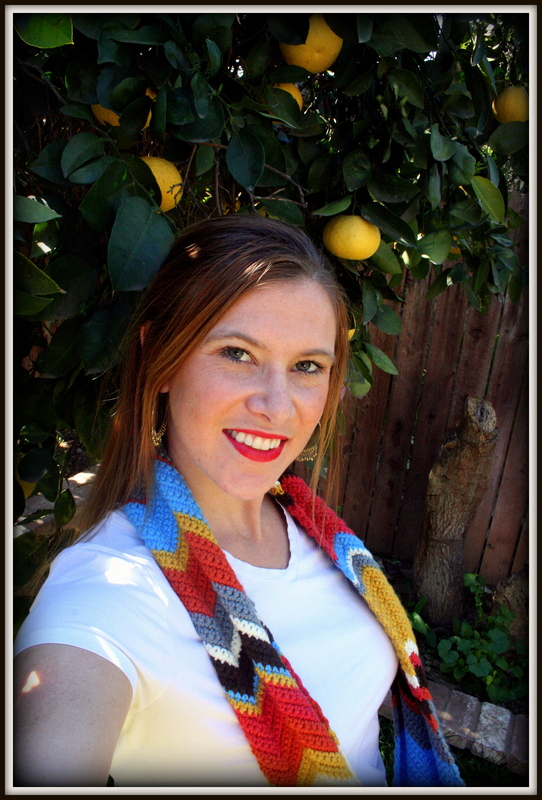 I have a new pattern to share today for my Chevron Infinity Scarf. I saw a similar scarf for sale on Etsy months ago but it had been sold and there wasn’t a pattern available for purchase. So after having it in the back of my mind for months, I finally tried my hand at making my own. Here is what I came up with! You can use any combination of colors that you’d like. I wanted something bright and was going for kind of tribal/Azteca colors. I don’t think the colors looked exactly “tribally” together, but I still love the result. I chose 7 colors and crocheted them in a random order. I used the random stripe generator to get started and then made up my own scheme after I got started. So, pick out some colors and follow my pattern instructions below. Have fun! Difficulty: Easy – Great beginner project! Yarn: Worsted Weight in various colors to achieve your desired look. I used a combination of Loops and Threads Impeccable and Vanna’s Choice. Sorry, but I don’t know the yardage for this project. That also differs on the length you choose to make it. *The drape is a little stiff with a G hook, so you may want to try a larger one, like an I. I was hoping it would soften up with wear, but it’s still a bit stiffer than I’d like after having worn several times over a few weeks. 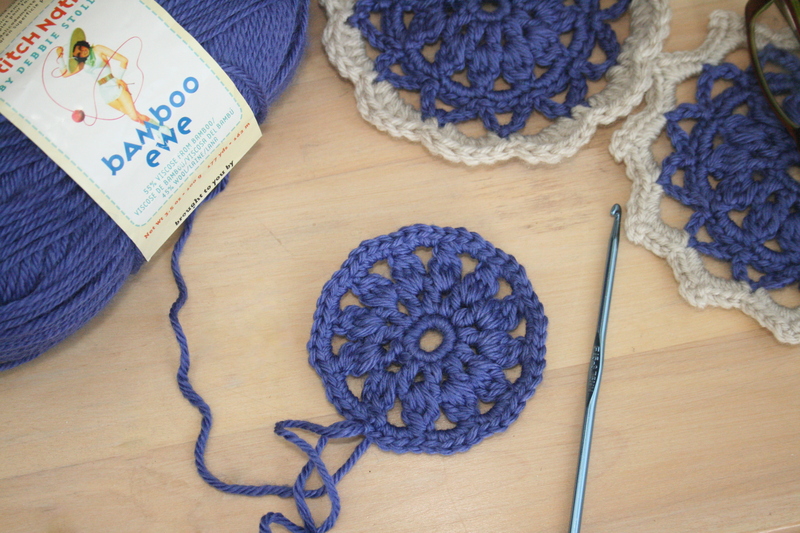 *Start and end with the same color to help hide the join when you attach the two ends together in a circle at the end. *To make the scarf wider, extend the length of the chain in increments of 8 (so instead of 32, chain 40 or 48). *Crocheting over the ends is a real time saver since there can be a lot of ends to weave in if you change colors as often as I did. Just hold the tails behind your work along the top of the stitches from the previous rows. When you make your stitches, insert the hook under the stitch indicated and include those tails. You’ll work right over them and they’ll disappear like magic! Row 1: 1sc in 2nd ch from hook, 1sc in next 6 chs, 3sc in next ch, 1sc in next 7 chs, sk next ch, 1sc in next 7 chs, 3sc in next ch, 1sc in next 7 chs to end. Turn. Row 2: Ch1, 1sc in 1st sc, sk 1 st, 1sc in next 6 sts, 3sc in next st, 1 sc in next 7 sts, sk 2 sts, 1 sc in next 7 sts, 3sc in next st, 1sc in next 6 sts, sk 1 st, 1sc in last st. Turn. Repeat Row 2 until scarf is desired length, changing colors as little or as often as you’d like to achieve your desired color scheme. Join the two ends together to make a circle. You can sew them together or crochet them. I chose to crochet them together with slip stitch. It’s a little funky, because you have to hold the ends at an angle to match up the peaks and valleys of the chevrons as you go along. Fasten off and weave in ends. You’re done! 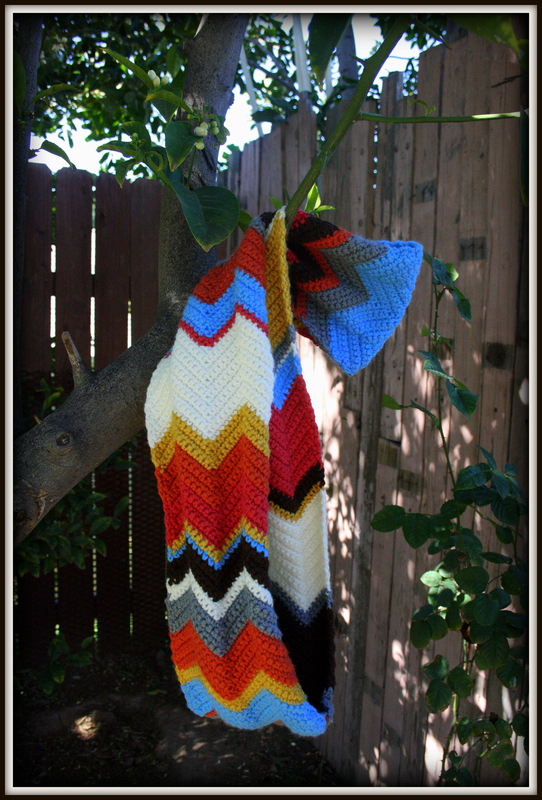 I hope you’ve enjoyed my pattern and will make your own scarf soon! PS…I am linking up this post over at Hookin On Hump Day at My Merry Messy Life. Go check out all the other fun projects that have been linked up to the party! 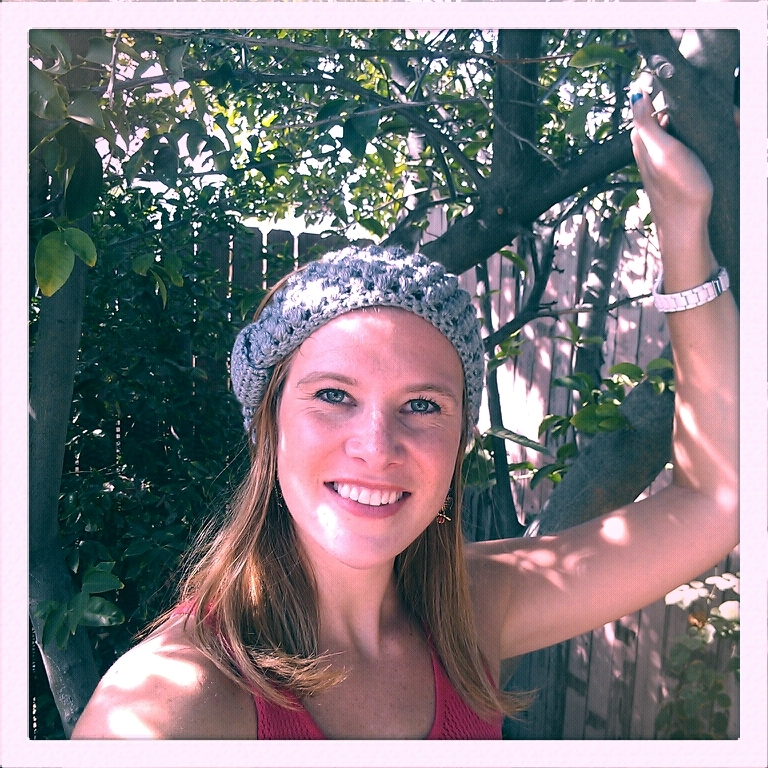 I’m so excited to be able to share another free pattern with my readers! 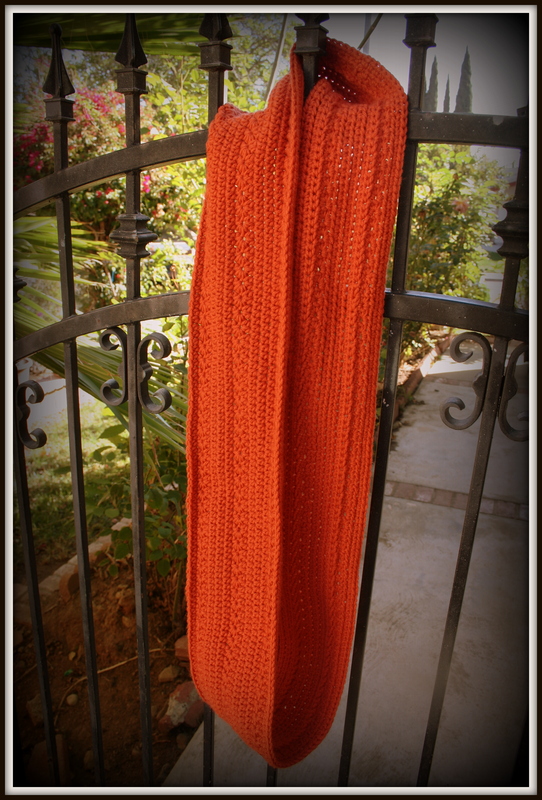 This is my Pumpkin Infinity Scarf. I learned how to crochet almost exactly 1 year ago. At the time when I decided to learn, I did not have much faith that I would even be any good at crochet, let alone that I’d be making my own patterns in just under a year later. So, if you’re just starting to crochet, keep it up!! And if you want to learn, but you haven’t yet brought yourself to buy a hook and yarn, go to the store and then come home and watch some you tube videos! You’ll be so happy you did. This infinity scarf uses only chain, hdc and the star stitch which, once you get used to it, is super easy to do! So I would say it is a beginner to advanced beginner pattern. There is a link below in the instructions to a you tube video on the full star stitch. EDITED 12-03-12: Please note that although the above videos do show that you turn your work at the end of each row, my pattern is worked in rounds and has NO turns. You’ll be joining the first and last stitches of each round with a sl st and then starting a new round with either a ch 2 or a ch 3 depending on the round you’re working. You can work in rows by making a ch 2 or ch 3 and then turning and then sew the edges together at the end if you choose. This might make the scarf reversible, but I wanted it to look very clean and seamless on the front so I chose to do rounds which makes a very noticeable difference between the front and back sides. To begin the full star stitch at the start of a new row, you will first ch 3. Insert hook into 2nd chain from hook and pull up a loop, then do the same in the next chain, then do the same in the top of the first 3 stitches of the previous row. There should be 6 loops on your hook. Next, yarn over and pull through all 6 loops. This makes the spokes of the bottom half of the star. Chain one to close the stitch. Next, insert hook in “eyelet” created by the last chain 1 and pull up a loop. Then, insert hook in last spoke of the star stitch you just made and pull up a loop. Then insert hook in same stitch from previous row that you made the last spoke of last star in and pull up a loop. Then, insert hook and pull up a loop in next two stitches from previous row. There should again be 6 loops on your hook. Yarn over and pull through all 6 loops and chain 1 to close. 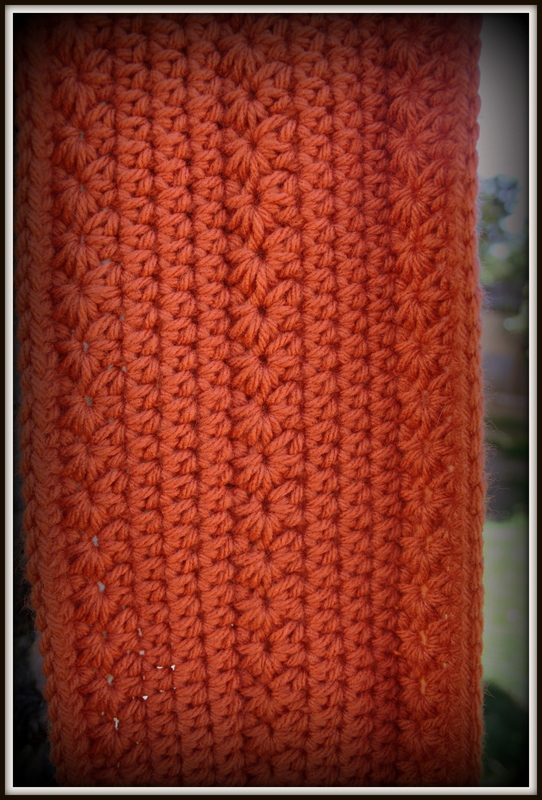 Continue until end of row and join to top of first star stitch with a slip stitch. To complete the full star stitch, chain 2, then make 2 hdc in the eyelet of each incomplete start stitch from previous row. Do this to end of row and join to the first hdc (not the ch 2) with a slip stitch. This all sounds much more complicated than it really is! Please watch the videos to see how easy it really is and to clear up any confusion from reading the instructions. It’s hard to write this out in a way that makes sense! Round 1: Chain your desired length, being careful to end on an odd number. 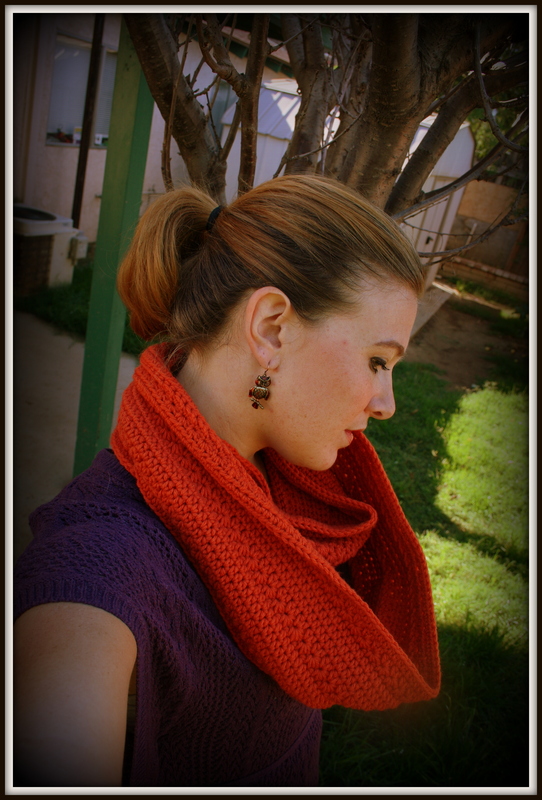 I chained 231 for the scarf pictured, which ended up being 64″ around when finished. Hdc in ridge of each chain to end. Join with first hdc with a slip stitch. Take a moment to weave in the end from the beginning and join the two bottom chains. *Note: if you choose not to hdc in the ridge, but in the loops of the chain, your scarf will not look symmetrical on both sides as the one in the picture does. If you don’t want to be able to tell which side was the top and which was the bottom, be sure to make your first row of hdc in the ridge of the chains. It seems to take a little longer, but is well worth the results. Round 2: Follow instructions above for the full star stitch, beginning with a chain 3. If you get to the end of the row and end up with one too many hdc for some reason, don’t despair!! Just insert your hook into that “extra” hdc for 7 loops on your hook and continue on. No one will ever know the difference and you won’t have to pull out all your work thus far. Round 3: Follow instructions above to complete the full star stitch, beginning with a chain 2. Round 4: Ch 2, then hdc in each stitch across to end of row. Join to top of 1st hdc with a sl st.
Rounds 5-6: Repeat Row 4. Round 7: Follow instructions above for the full star stitch, beginning with a chain 3. Round 8: Follow instructions above to complete the full star stitch, beginning with a chain 2. Rounds 9-11: Repeat Row 4. Round 12: Follow instructions above for the full star stitch, beginning with a chain 3. Round 13: Follow instructions above to complete the full star stitch, beginning with a chain 2. Round 14: Repeat Row 4, but do not join with sl st. Instead, use the seamless finish method shown in this video here. Weave in ends if you did not do so at beginning and with seamless finish. 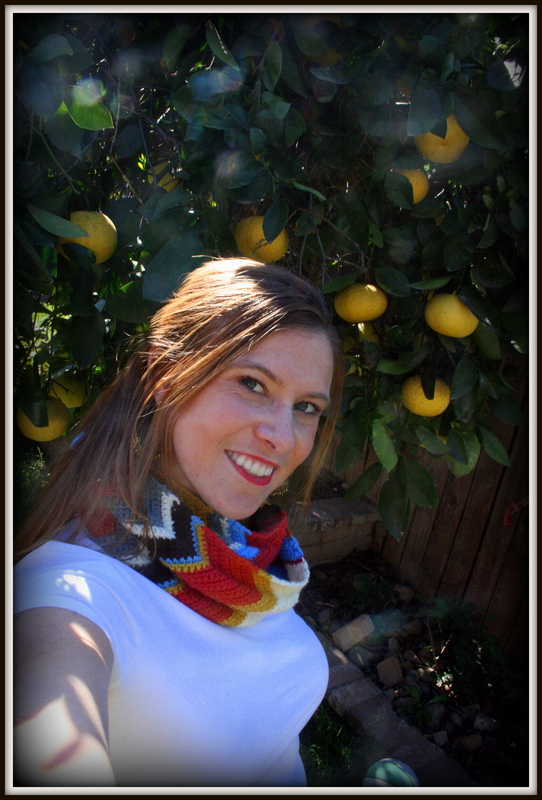 Now, put on your favorite tee, throw on some cute boots over your favorite jeans and rock that gorgeous infinity scarf! PS…I am linking up over at The 36th Avenue. Please go check out some of the awesome projects others have been up to! Great stuff over there, as always!! 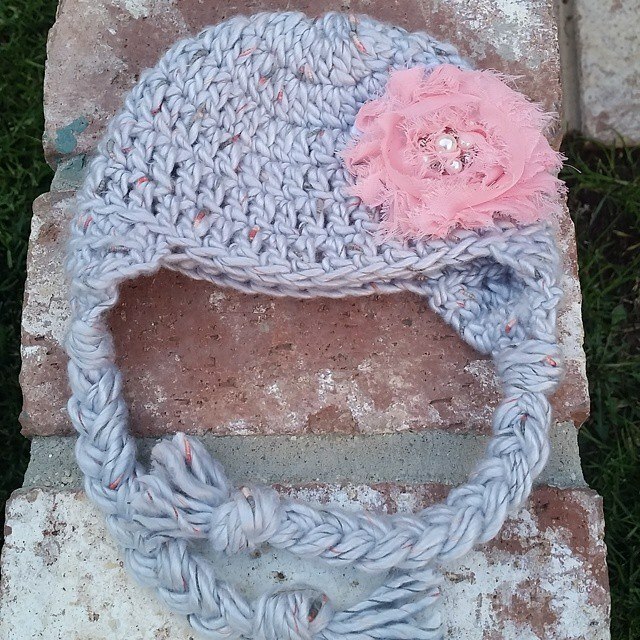 Last week, I found a few really cute crocheted items floating around on Pinterest and I knew that I could merge them together to create my own pattern. 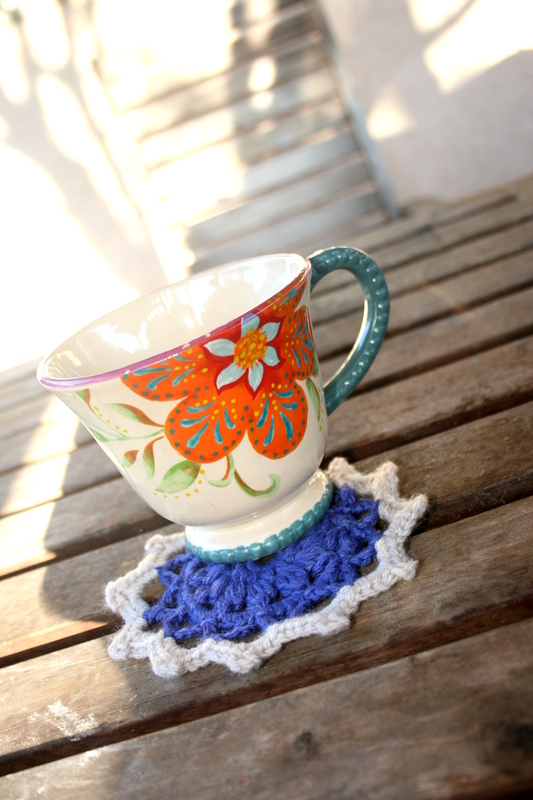 After playing around with hook and yarn, I came up with this….. I am really pleased with how this turned out! I haven’t taken any pictures of it yet, but I have another on the hook right now in yellow and I can’t wait to finish it so I can wear it, too. I have worn the gray one twice already and have received a lot of compliments on it. If you’d like to make a puff stitch headband for yourself, I have written out the pattern below and you can also add it to your Ravelry queue here. I hope it is clear enough to follow, as this is the first pattern I have written. If something does not make sense, or you need clarification on anything, please let me know! Puff Stitch: Yarn over, insert hook in stitch indicated and draw up a loop (there will now be 3 loops on the hook). Next, [yarn over and insert hook in same stitch and draw up a loop] 3 times (there will be 9 loops on the hook). Now, yarn over and draw through first 8 loops, then yarn over again and draw through remaining 2 loops. Round 1: Sc in ridge of 3rd chain from hook and in each ridge across. I like to crochet into the ridge, because it leaves the “V” of the chain showing on the bottom of the piece and makes for a cleaner look, in my opinion. Here you can see where I’ve made my single crochets into the ridge of the chain on the right. You can also see the ridge and then the V’s on the left where you usually make your single crochets. I like to leave those intact, but that’s just me. I hope this visual helps explain a bit more what I mean about crocheting into the ridge of the chain. Here you can see where I actually inserted the hook to make my next sc stitch. After you sc in each ridge to the end of the chain, you will slip stitch both ends together to make a circle. The tops of the chain will be connected, but the bottoms of the chain will not. I know this seems funky, but you will stitch them together at the end. Round 2: Ch 3, sk 1st sc, Puff in next sc, *ch 1, sk next sc, Puff in next sc*, repeat *to* to end of row. Ch 1, sl st to top of first Puff. Repeat Round 3 until the headband is the desired width. I did 5 rounds of puff stitches to make my headband. Final Round: Sc in top of each Puff stitch and chain stitch around to end. Join to first sc in round with sl st or seamless join method (my favorite method for joining!). 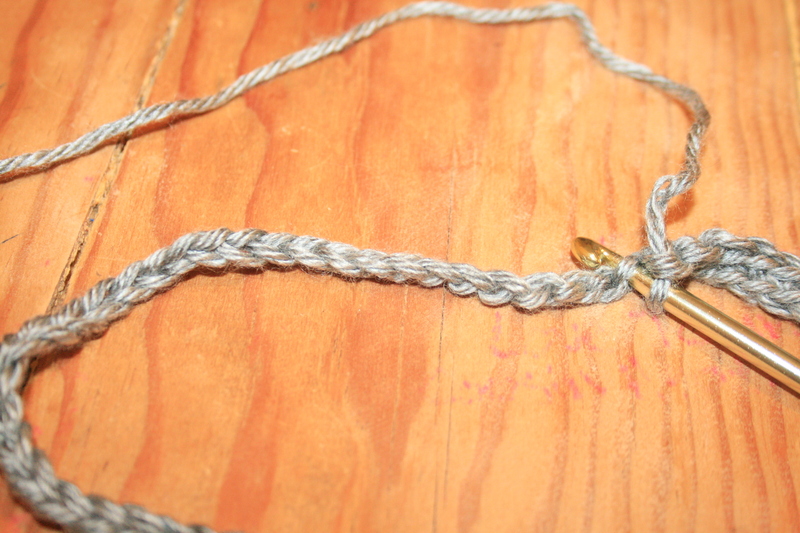 Weave in ends and go back and stitch together the bottoms of the chain from the beginning. Ch 6, hdc in 2nd ch from hook to end, ch 1 and turn. Hdc in front loops only across (5 hdc), ch 1 and turn. Repeat this row until band is desired length. 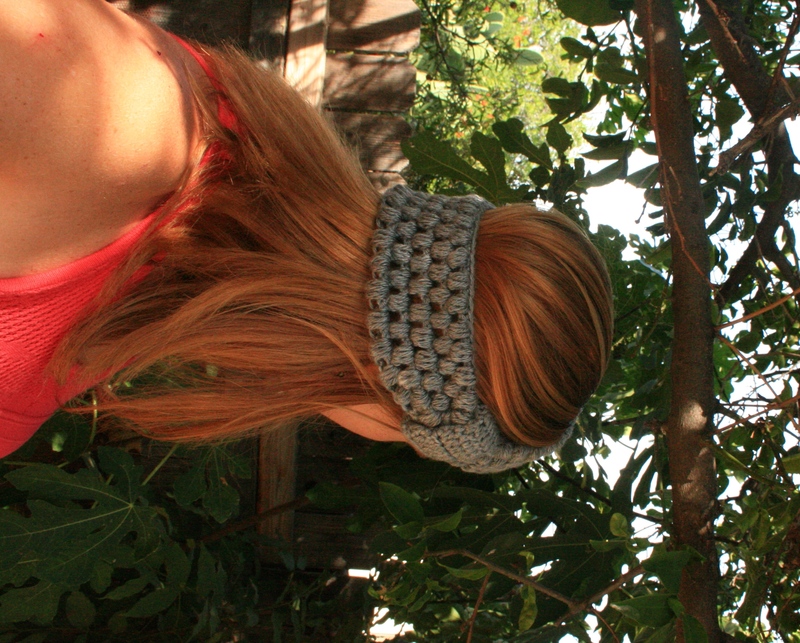 the shorter you make it, the more ruched appearance your headband will have. I made mine about 5.5″ long. 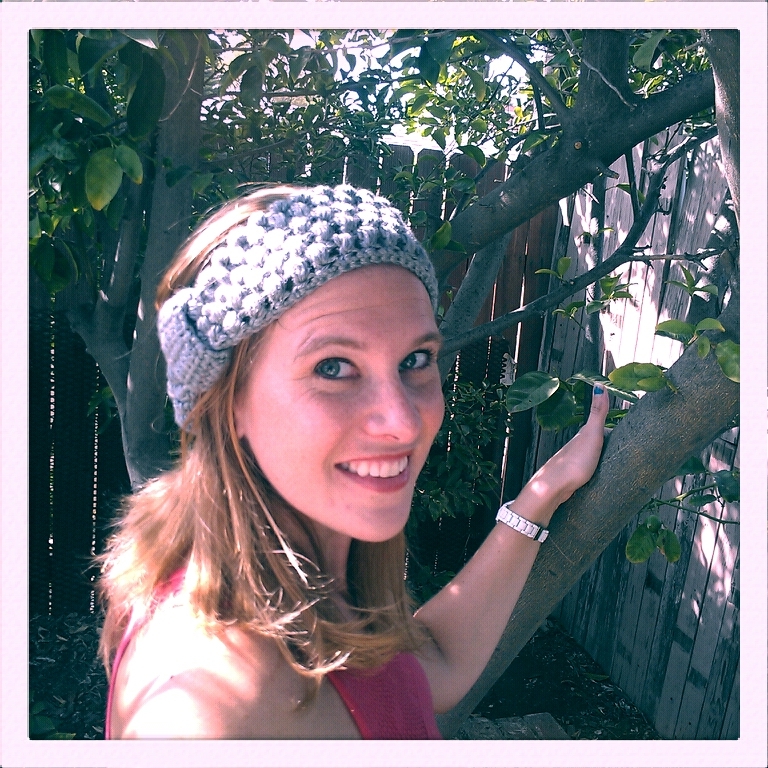 Wrap band around seam of your Puff Stitch Headband and sew the edges together on the inside of the headband. Weave in your ends and you are done! These would be great to whip us as quick gifts! Of course you can play around with this and try different stitches, maybe do the knotted band in a different color or add a flower instead. I hope you enjoyed my first pattern! !